In our continuing effort to capture vocal recording in good quality at events, we have experimented with another "last resort" method. This has been accomplished by attaching a digital voice recorder to the handheld microphone. Before you think it is ugly or out of place, please be aware - when in use, most people will not notice it. Regarding sound quality, take a listen to the clip below. The first segment was the original file straight from the recorder without any processing. The repeated segment has Treble Filter and Bass Filter applied in Premiere Pro. In another test with the Sony ICDUX523 Digital Voice Recorder, it delivers even better sound quality compared to the Olympus WS-803 without using any filter at post. This method would be a feasible solution. However, it should be considered as a backup or as a “last resort” for a videographer to obtain more than acceptable sound quality at an event. Posted by Daniel on 6/11/2013 10:23:00 PM I tend to use the Wired Lav + Zoom H1 on the groom, and a shotgun mic on my GH2 for ambiance. I have had some trouble though with that one mic solution, for instance if the celebrant is a bit of a distance away, their voice doesn't come in as loud. I'm looking into a second wired lav * recorder solution, but the alternative wired lav over a DJ speaker (most of the celebrants I work with use a portable speaker and mic that they bring along) may be a good backup system. Receptions are where I have a little bit of issue. They tend to run around with a wireless mic, which means I either have to mic a DJ speaker... or in some cases, resort to my on-camera mic. Not exactly the best solution. I found the H1 is a little bit of candy bar bulky for the groom to put in his pocket. You can try this $47 Sony voice recorder if you intend to record with a wired lav mic. (1) Mounting your H1 on light stand placed near DJ loud speakers. (2) Bring your own mic stand. Tape your H1 on it. Work with the DJ and people giving speech to use the mic stand. The result is excellent. 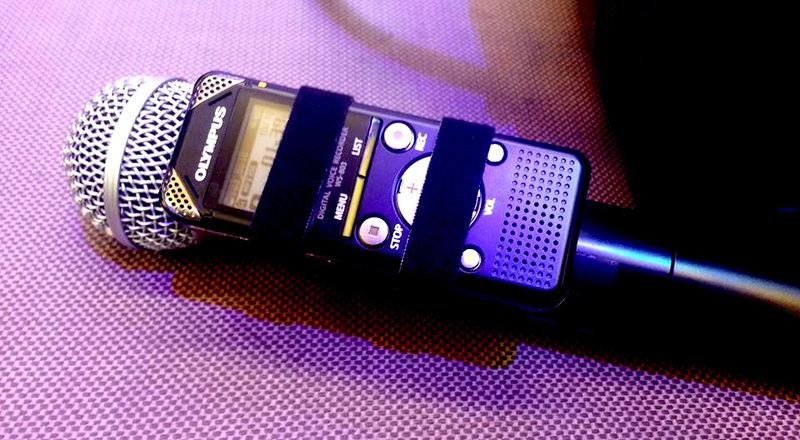 (3) This new method we tried, by taping a small voice recorder to the handheld mic. Posted by jeff harper on 6/12/2013 7:50:00 AM Taky, attaching a recorder to the mike is an excellent idea, I am going to purchase velcro straps today. Thanks very much for sharing your great idea with us! Posted by jeff harper on 6/12/2013 7:58:00 AM I intent to use this method regularly for toasts and speeches, not ceremony so much. Replied by LA Color Pros Jeff, thanks for your comment. I will still be putting lav mic on officiant and groom during ceremony. This method comes handy as a backup purpose. Posted by cre8tive on 6/12/2013 4:18:00 PM I've used a lav. mic. with my Zoom H2 for talking head interviews with much success, syncing up the audio/video in post. I had been wondering how the H2 would perform on a stand in front of a loudspeaker, so I very much appreciate your posting an example. Now I can add this solution to my bad of tricks with confidence. Since I'll be on camera, my only concern is leaving the H2 unattended, especially if the event lights are low. Perhaps a small LED light attached to the stand will warn pedestrians off. Replied by LA Color Pros Thanks for your comment. We usually put a Comer 1800 or Comer 5500 LED light on light stand placed on the corner of the dance floor near the DJ's loud speaker. Then Velcro the H2n on the light stand. It works well. Posted by cre8tive on 6/12/2013 6:41:00 PM Very clever. It sounds exceptional. What I like most about this solution is I have total control; no bothering the sound board operator for an XLR feed, or taping down cables. And, most importantly, it totally rules out getting a bad feed, which has happened on occasion. Finally, if I need to pick up and move, my camera and I are not tethered to the sound board. I love my H2! Replied by LA Color Pros We upgraded our H2 to H2n because of the longer battery run time. I personal love using H2 with the 2 channels surround mode. I set to record 90 degree on front microphones and 120 degree on back microphones as Left and Right channel. Then I can use the Fill-Left or Fill-Right filter in Premiere to select which channel to be used. If I need more cleaner vocal sound, I will pick the left channel (Front mics). If I need more ambiance sound, then use the right channel (Rear mics). Posted by Jeff on 6/13/2013 4:19:00 AM Thank you! That is actually a very good idea even for corporate events! Posted by Doug on 6/13/2013 4:24:00 AM Many thanks. Great timing as I'm just about to start doing video interviews. Is this a good setup to interview a guy at his business? I'll also need lights plus stands for the lights, what do you recommend? Also interested in doing Green Screen. Would I use the same lights or need more lights? Replied by LA Color Pros Hi Doug, thanks for your comment. For interview, it might be better to use a lav mic connected to a digital voice recorder. That gives the best result. Comer CM-LBPS1800 is a great light for interview purpose and green screen work.